Ah, winter. Those of us who've lived in a cold climate like Minnesota for a number of years know that winter is not just a season. It's a force, it's a living thing. And while maybe it's not actively trying to kill us, it certainly doesn't care if we live or die. It's all we can do to survive the cold, the snow, the dark, the seasonal affective disorder. But winter is also a welcome time to slow down, to reflect on one's life, to recharge for the coming spring. Because spring will come again, as hopeless as it sometimes feels when the temperature fails to climb above zero or a sudden snowstorm forces you to cancel your plans. But as Bradley Greenwald tells us in his solo show The Longest Night, our ancestors have given us a solution to this possible death by winter - celebration. And The Longest Night is most definitely a celebration. A celebration of winter, and a celebration that winter will end. I truly loved this show when I saw it two years ago (the solstice celebration appeals to my inner pagan), and it's just as comforting, inspiring, funny, and touching this year. Since it's virtually the same show, I'm copying what I wrote then here. I highly recommend The Longest Night as a unique and uniquely special holiday show (playing at Open Eye Figure Theatre through December 23). There's one holiday that no one can escape at this time of the year, at least not those who live as far from the equator as we do here in Minnesota. And that is the solstice, the longest night of the year. It is a holiday that predates Christianity by millennia, a time when our ancient ancestors wondered if the sun would return from it's long sleep, and celebrated when it did. These solstice celebrations form the basis of modern holiday celebrations in many diverse cultures; they all begin with this simple fact of nature. Right now, here in Minnesota, we have less than nine hours of daylight, and it's decreasing every day. But soon, after December 21, that will turn around and the days will begin to lengthen to their summer height. What better reason to celebrate is there than that? The wonderfully talented local music-theater artist Bradley Greenwald has created a one-man show around this idea, and it's completely delightful. 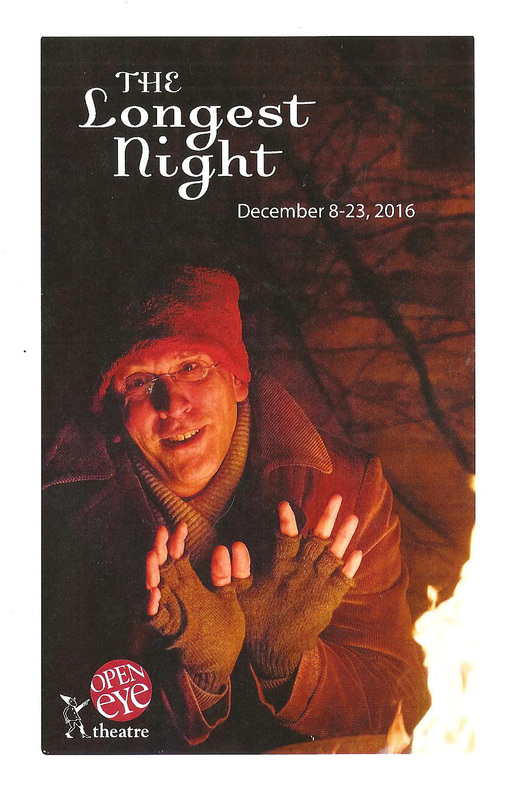 Accompanied by Sonja Thompson on the piano (and himself on the baritone), he regales the audience with songs, stories, and poems of the solstice, this winter season that we're right in the middle of. Part science lesson (complete with visual aids), part history, part mystical spirituality, The Longest Night is the loveliest of celebrations of the season. Don't expect to hear the usual holiday songs, the ones repeated on endless repeat on radio stations and in the mall. I did not recognize more than a few songs, but they are all perfectly appropriate to the theme. From Carole King's "So Far Away" (the sun is so far away at this time of the year! ), to "The Cold Song" from the opera King Arthur, to Dar Williams' "The Christians and the Pagans," to "Let the Sunshine In" from HAIR, along with the writing of Margaret Atwood, William Blake, and Ogden Nash, each selection is a celebration or a lament of this cold dark winter season. When you're doing a show about darkness and light, the lighting must be paid attention to. And it is here. From total darkness to soft candlelight to the bright light of the returning sun, Kathy Maxwell's lighting design highlights every point in the show. And the sound design (uncredited here, but credited to Sean Healey in 2014) allows Bradley to sing harmony with himself - if there's anything better than one Bradley Greenwald singing it's multiple Bradley Greenwalds singing! Bradley has a gorgeous opera-trained voice and elevates every song he sings (especially unmiked in a small space! ), and turns poetry and prose into music. He closes the show with a song by one of my favorite local musicians, Peter Mayer's "My Soul." Bradley turns this poignant and simple folk song into a glorious anthem that will send chills down your spine. It's always a thrill to listen to this "baritone with a baritone," never more so than in this hand-picked collection of songs and stories around a very relevant theme.